The purpose of the Cosmic Background Explorer (COBE) mission was to take precise measurements of the diffuse radiation between 1 micrometer and 1 cm over the whole celestial sphere. The following quantities were measured: (1) the spectrum of the 3 K radiation over the range 100 micrometers to 1 cm; (2) the anisotropy of this radiation from 3 to 10 mm; and, (3) the spectrum and angular distribution of diffuse infrared background radiation at wavelengths from 1 to 300 micrometers. 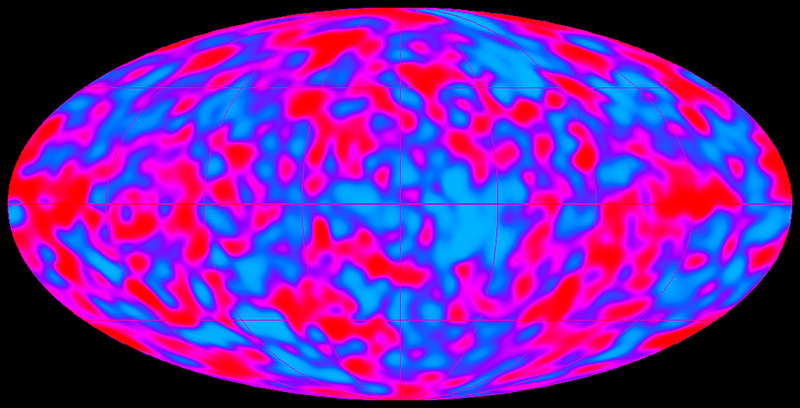 The cosmic microwave background radiation is a remnant of the Big Bang. These minute temperature variations (depicted here as varying shades of blue and purple) are linked to slight density variations in the early universe. These variations are believed to have given rise to the structures that populate the universe today: clusters of galaxies, as well as vast, empty regions. The experiment module contained the instruments and a dewar filled with 650 liters of 1.6 K liquid helium, with a conical Sun shade. The base module contained the attitude control, communications and power systems. The satellite rotated at 1 rpm about the axis of symmetry to control systematic errors in the anisotropy measurements and to allow observations of the zodiacal light at various solar elongation angles. The orientation of the spin axis was maintained anti-Earth and at 94 degrees to the Sun-Earth line. The operational orbit was dawn-dusk Sun-synchronous so that the Sun was always to the side and thus was shielded from the instruments. With this orbit and spin-axis orientation, the instruments performed a complete scan of the celestial sphere every six months. Image shows the diffuse infrared background, anisotropy, and spectrum result from COBE. For more info. COBE was launched November 18, 1989 and carried three instruments, a Far Infrared Absolute Spectrophotometer (FIRAS) to compare the spectrum of the cosmic microwave background radiation with a precise blackbody, a Differential Microwave Radiometer (DMR) to map the cosmic radiation precisely, and a Diffuse Infrared Background Experiment (DIRBE) to search for the cosmic infrared background radiation. Instrument operations were terminated December 23, 1993. As of January 1994, engineering operations were to conclude that month, after which operation of the spacecraft was transferred to Wallops for use as a test satellite. 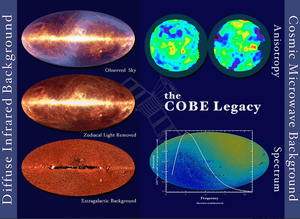 The NASA WMAP mission (2001-2010) and the ESA Planck mission (2009-2013) continued the legacy of COBE, studying the cosmic microwave background in ever greater detail. COBE revolutionized our understanding of the early cosmos. It precisely measured and mapped the oldest light in the universe -- the cosmic microwave background. The cosmic microwave background spectrum was measured with a precision of 0.005%. The results confirmed the Big Bang theory of the origin of the universe. The very precise measurements helped eliminate a great many theories about the Big Bang. The mission ushered cosmologists into a new era of precision measurements, paving the way for deeper exploration of the microwave background by NASA's WMAP mission and ESA's Planck mission. Scientist John Mather, from the Goddard Space Flight Center, and George Smoot, at the University of California, Berkeley, shared the 2006 Nobel Prize in Physics for their discovery of the blackbody form and anisotropy of the cosmic microwave background radiation measured by COBE.